If you walk out of this small port and turn left, a ten minute stroll along a single track road will bring you to Skliri, the forest and the "Alkyoni". 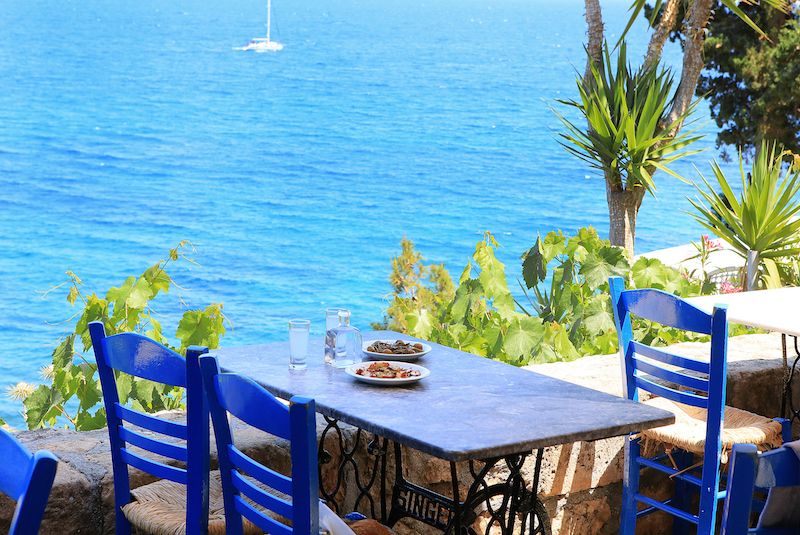 This small taverna sits on the edge of the forest looking directly down into the sea. It was built in the early 1980's by Takis and Leo who still run it today. Alkyoni has its own pace and its chilled out atmosphere is to be taken in notice once setting foot on it. 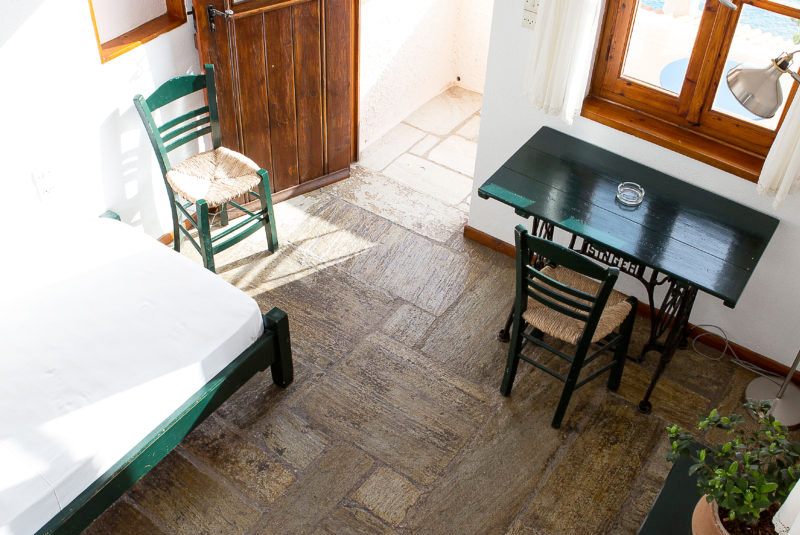 Attached to the taverna are 15 bedrooms and a number of private rooms in a two-storeyed building. At the heart of the taverna is Takis' kitchen. The restaurant is based on traditional greek cuisine, accompanied by turkish inspired dishes.. The kitchen is famous for its excellent food and people come from all over the island to eat here, even by boat from neighbouring Aegina. Passion for the Alkyoni is shared by so many different independent travellers. They come from Athens, other parts of Europe and indeed the rest of the world. They enjoy the hospitality of its hosts, Leo and Takis. They recognise that the taverna offers a peace and tranquillity that is now so often very difficult to find. A great Greek philosopher, Leo Thanopoulos, once wrote, about the Alkyoni, "One look and you're hooked!" We think he is right. Chief among these is the Alkyoni Inn. Perched on a bluff with breathtaking views of Aegina and the Peloponnese beyond, this 14-room hotel is among the very best in the vicinity of Athens. Its cuisine is as tasty as it is imaginative (Turkish-inspired meze are served alongside traditional Greek fare); its bonhomie unbeatable, thanks to the unusually relaxed take on life of its proprietors; and at 50 euros for two, its rooms supremely affordable. The atmosphere is so chilled that guests help themselves to breakfast (at 4 euros particularly worthwhile). 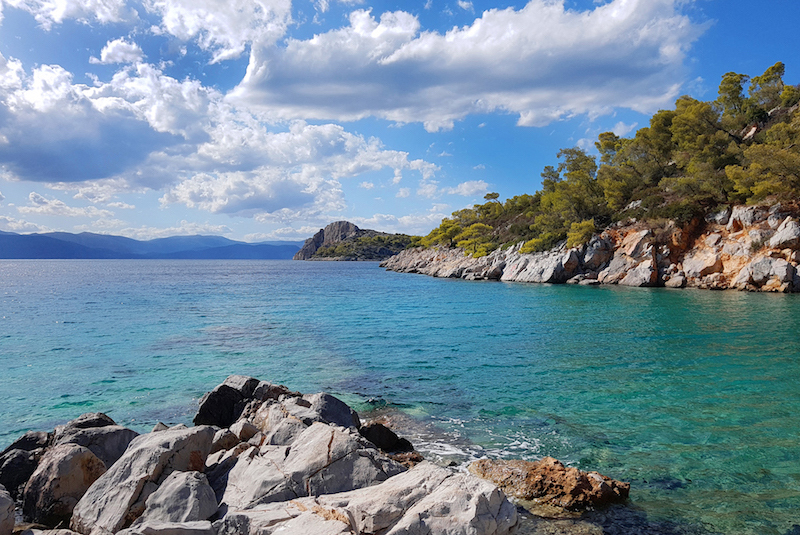 For years, Alkyoni was the exclusive reserve of those visiting Halikiada, Angistri's Largest natural bay and one of Greece's first nudist beaches. Ever since, the islet has drawn its fair share of curious rubberneckers, but most, upon landing, make the the mistake turning right, into tacky touristville, rather than left up towards the Alkyoni. To escape from the bustle of athens, take a boat to the pine-clad isle of angistri, less than two hours away. Here you can swim in secluded coves or hike (about an hour) to the village of Limenaria. Then return to the port for lunch with a sea view on the terrace of Hotel Alkyoni, where the cook makes a memorable pastitsio. Lunch is about 15$ for two. Accomondation: The island has a capacity of approximately 600 beds in rooms and hotels. We would like to propose you lodge at the one of the two complexes of the Alkyon Hotel in Skala. One is on the the coast and one is in the heart of the forest. Food: Angistri has many restaurants and tavernas which, however, do not quite live up to standarts. Nonetheless,some of them are worthwhile. For instance, the restaurant of the Alkyon hotel is certainly a must.